The weather in the off-season, as everyone is painfully aware, was not cooperative. I did not finish the kart until the week before our first race and then we just had to trust that it was done right. Last year, we were able to start practicing in February. Not so lucky this year. The weeks before this race we worked to get the kart ready and get back in to the rhythm of racing. We had to collect accessories parts and tools, check the weather obsessively, find the awning and chairs, try on and pack race gear, plan drinks and snacks, etc.. Finally on Friday night, we loaded it all into the truck set out for the track early Saturday. Jason grew this winter, which is not surprising for an 8 year old. But this meant he needed a bigger seat and a new suit. A kart seat is like skate or ski boots – it needs to fit tight so the driver has good support and control – but it also means kids grow out of them quickly. A race kart is a finely balanced machine and changing the seat also changes everything else on the kart, from the motor to the steering wheel and pedals. Everything needs to be adjusted to accommodate to the driver’s new size and position. We also bought a new motor to replace the used one we ran for the last 2 years, and which was a few years old when we got it. I would have preferred to have set it up and tested it in practice conditions but sometimes you just need to work with the time you have. In order to prepare for the season, we headed to Concept Haulers Motor Speedway for their first race. 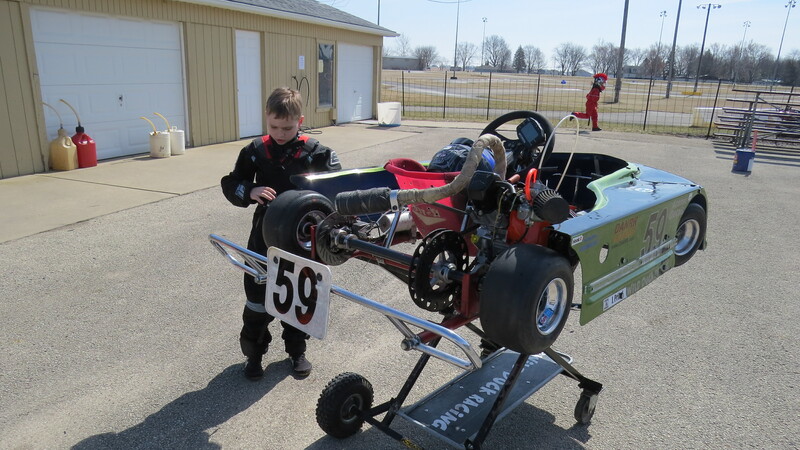 We needed to get some track time in to make sure the kart is ready for the more challenging Mid-State Sprint Series. For our first run at practice we focused on just breaking in the new motor and remembering the track. To break in a motor you need to run it under load (drive it) over a wide range of conditions, fast, slow, light acceleration, heavy acceleration with standard car oil. Between the first and second practice session I removed the break-in oil and poured in the 4T Amsoil that we normally race with. Jason, drove the kart like he had never been away and the kart handled great. All of the test fittings in the basement really paid off. This race brought some new friends and some old ones. Chad (#56), Kyle (#26), Logan (#27) are back. Racers Ryan (#99) and Skyler (#5) are new to the sport, though Skyler has some indoor racing under her belt. Finally, Sophia (#83), Skyler’s older sister was a great addition to the group. She has a lot of indoor experience and was very smooth and fast. It was shaping up to be a great racing day. The only issue during practice was when the right king pin on Kyle’s kart shattered as he drove over the tunnel. It caused him to lose a wheel and he slid off the track into the mid-field. Thankfully, everyone was unharmed and the kart was fixed but not quite the same for the rest of the day. After the usual drivers meeting and opening ceremony the races got under way. Jason was scheduled to start the first heat in 7th position, but he swapped to 6th with Skyler because it was her first race and she is a very green driver. This spot was actually very good for him because it meant he will start the second heat on the pole. If he does well in both heats, he should be on the pole for the feature. After a rough start with stalled motors and confusion, Jason leapt from 6th right up to to 4th trailing behind Kyle, Chad and Logan on the green. Sophia caught and passed Jason at the end of the first lap and Logan got by Chad. At the end of the next lap Kyle, Logan, and Chad all slide into the infield as they entered turn 13 in a slow tangle of karts. This left Sophie in the lead and Jason in 2nd. Jason chased Sophie for another lap until they came up on Skyler’s very slow kart on the hill again. Jason was able to get by Sophie in turn 14, but got bogged down by Skyler between turn 2 and 3, and Sophie took the lead again. Jason passed Skyler in turn three and took off after Sophie until the last lap where he set up turn 4 just right to pass her in the back straight. From there, it was straight on home to the checkered flag for the the first win on the season. For the second heat they reverse the order of the first so Jason started on the pole. He got a great start and led the 6 lap heat all the way to the last corner of he last lap. Chad had been running hard and caught up with Jason just as they caught the slower Skyler. Jason checked his brakes to avoid hitting her, but that caused Chad to bump the rear of Jason’s kart. Jason spun off the track and stalled out the engine. He ended up in last, after a really great run. Disappointing but understandable. With the win in the first heat and the last in the second heat Jason was placed in the third position behind Chad and Sophie. This was just about the worst place for him to start the feature. It was going to be tough to get by both of these skilled drivers. At the green they got a good start: Chad and Sophie followed by Jason. Chad started to pull away as Jason worked at finding the edge around Sophie. In the 6th lap Jason at last passed her in the back stretch. She made one attempt to under cut and gave him a little bump in the hairpin but he hung on and kept driving the line. Even with 6 more laps there was not enough time for him to catch Chad – he was just too far ahead. Jason finished his first race of the 2014 season with a mighty fist pump as he crossed the finish line. Aside from enjoying another race, the main goal for this day was to test the kart and team as we get ready for the Mid-American Sprint Series on April 11th. 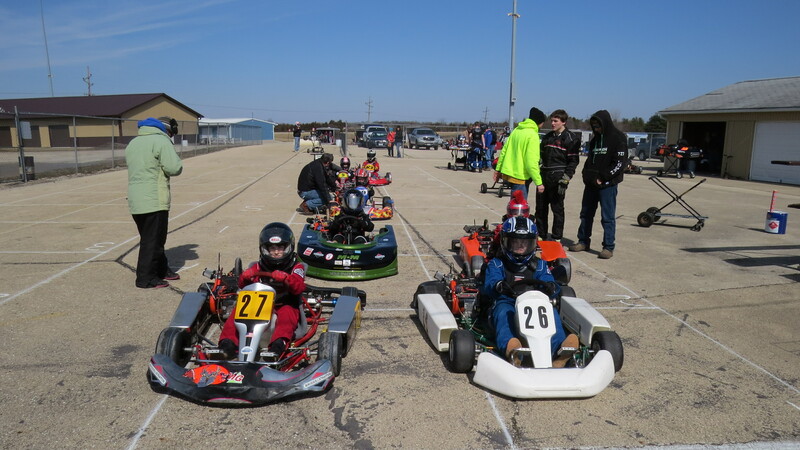 On Thursday, we will be leaving for Mid-State Kart Club in Springfield, IL for the first of 5 race weekends, allowing us some practice time on Friday. Some of the best Briggs LO206 teams in the Midwest are expected. It is going to be a very challenging weekend. Thanks to Brandon Kline for giving us some much needed advice and support; he really helped tune Jason back to the track. The new Concept Haulers Track Tech, Marty Murray who is going to be a wonderful asset to the already great crew. Most importantly, to my supportive wife and daughter who let us boys play together all summer long.